Squash House Quilts: Love at Last! It's been an interesting couple of weeks since my last post! We've been doing a lot of work in the garden as well as having the house painted between rainstorms! Crazy weather for our part of the country. Our painter has had many delays, but we're slowly making progress. I haven't had much time for sewing (except for one Supreme sewing project I won't be revealing for a while yet) but have been spending a lot of time with Mr. Squash refereeing Sasha and Gracie May. I'm happy to say there is no more need to referee! They're now buddies! In fact, Sasha has taken on the role of "Sister-Mommy" to Gracie May. I shot this video yesterday. They had just gotten a new bed big enough for the two of them. About an hour after the bed arrived we were so happy to see them both in it! Pardon the shakiness at the beginning -- I was trying not to disturb them! I did manage to finish another of my Kathy Schmitz BOM's. 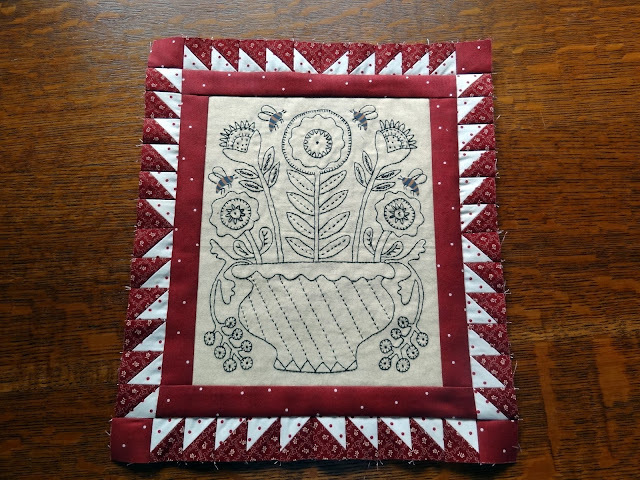 There are two more finished stitcheries that need their borders applied. I'll show them to you just as soon as I get them done. With all the rain we've had the garden isn't going anywhere fast, but we do manage to get a cereal bowl full of blueberries every day or so from our nine plants! I fear the slug population just might increase exponentially if the rain doesn't stop soon! Has anyone else been having trouble posting comments from your daily Bloglovin' feed? Some blogs that I follow I can post comments, but for others I need to get out of Bloglovin' and actually go to the blog in order to post a comment. If anyone has a solution for this issue, I'd love to hear it! The video is so sweet! So precious! I love your stitchery. That is quite stellar. We have had a lot of rain here and I'm afraid my poor garden has gotten soggy. I'm gonna have to head out later today when the mosquitoes go away and see what I can salvage. So thankful for the Farmer's Markets when things get like this. Gracie certainly looks like she loves being groomed by Sasha. Aren't they sweet as can be? :o) Next thing you know Sasha will be telling Gracie about her TP expeditions! Beautiful stitchery. Awwww! Things are as they should be. Our cats acted a lot the same way and now are best buddies. We keep thinking of adding a third cat, but that might be the straw that broke the camels back. I love those stitcheries. I am finding I like to have projects with multiple techniques, it keeps me from getting bored with a project. Yes, Candace, having to get out of Bloglovin is something I'm experiencing as well. I'm trying to figure out if its because of some blogs having their own email address. For instance, I cannot post on your blog unless I go out of Bloglovin. I'm staring to put the blogs on my blog' s sidebar to read with the top blogs being listed that have posted most recently. I HEART the girls together in their new bed. They really are sisters now. Doesn't look like you'll have any more worries. The video is as cute as it gets. Awww! How Cute that Sasha is acting like a mommy to Gracie now ! Love it! Oh, how sweet!!! Yep, they are now good buddies. We're having plenty of rain in the typical popup thunderstorms. Makes for some steamy weather. Wish some of that rain would fall south of you on the wildfires. Oh it's so sweet to see Sasha giving Gracie a cleaning. It looks like all is well and they have settled in with each other. Your BOM is beautiful. 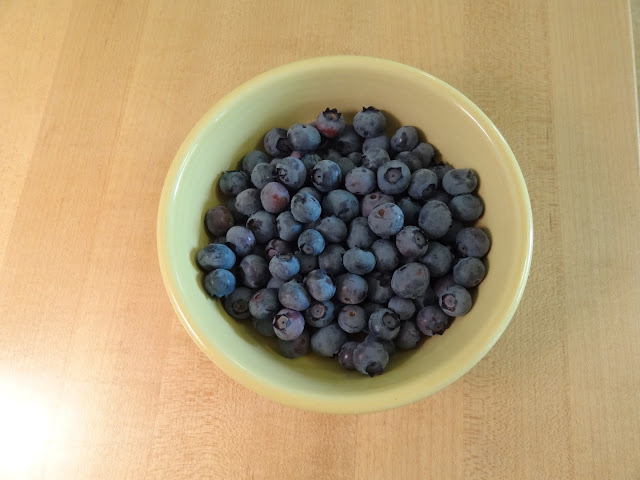 We've been picking blueberries at a local organic farm. I love blueberries. For all the weird weather we are having by this time next week we'll be in the 100's, ugh - I'm not ready yet. Hugs!! Yay there is peace in the valley...well, the Squash House anyway. Love that the girls have bonded. You knew it would just take a little time. Love the stitchery block I have one UFO project that is a stitchery. Remember seeing the Birdie of the Month blocks a couple of years ago? Not sure what is going on with Bloglovin' but there are already a couple of things I do not like about it. Why can't google just leave things alone? Sasha reminds me of my big brother. Just had to get used to me! How lovely that your girls are now friends, patience does pay dividends. What a lovely video of your two girls together. 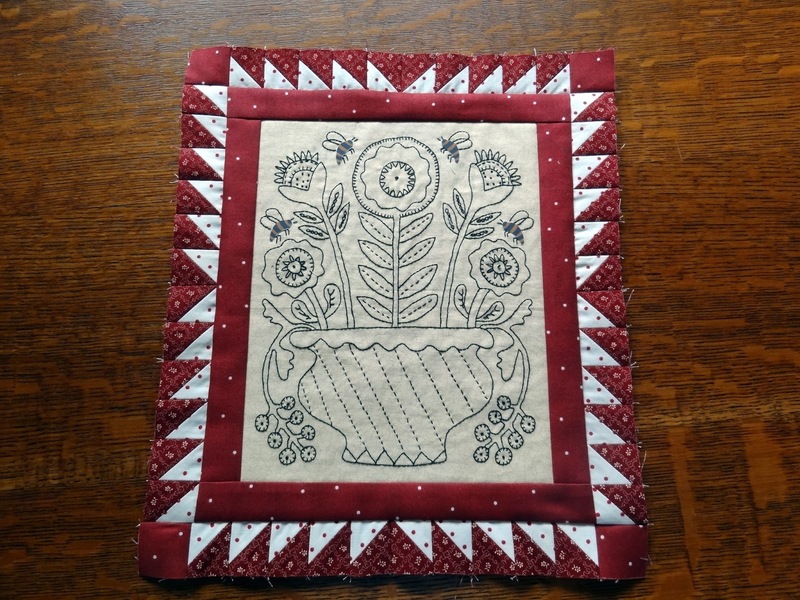 The stitchery is great, is the border your own design? I love stories...especially those featuring animals...with happy endings. They were destined to become best friends, right from Sasha's first growl. Your stitchery is beautiful. I'm so tempted to order the entire set but keep on talking myself out of it because I have so many other projects that I'd love to do. Oh, the video made me smile. That is so sweet that they have finally become 'sisters'. I can't wait for our blueberries to get ripe! I'm so glad their friends now! I keep hoping to see that same kind of love with Sammie and the pups but that probably isn't going to happen. They are co-existing though. I was having the same issues with BlogLovin as well with comments - I can on some blogs and others I could not. I contacted them, received an email asking a question and then nothing. I have since moved to Feedly because I can at least click the blog title to go to the blog post easily vs having to find the blog myself.